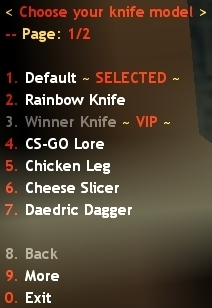 This plugin adds a menu from where you can choose different knife skins. 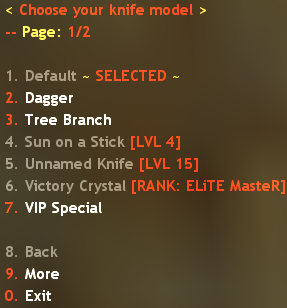 It also has an API which allows to create sub-plugins, such as knife skills/abilities. The knives can be added in the file configs/KnifeModels.ini by putting the knife name on a new line in square brackets, for example [Cool Knife]. Bear in mind that all attributes are optional. Last edited by OciXCrom; 02-15-2019 at 15:18.
i have feeling that your next plugin is ak47 models xD. Last edited by JusTGo; 02-05-2017 at 15:24. If someone decides to make an ak47_maps only server, no problem. and what about de_dust2 only server . Well, there aren't any de_dust2 models for players to change, are there? nope but who know maybe someone come with a good idea for servers like this. It's called SubMenu, definitely organized and e-t-u. What would be the thing that makes the knives different in each category? I really don't feel like doing that, especially if there's no good reason. Last edited by OciXCrom; 02-06-2017 at 16:12.